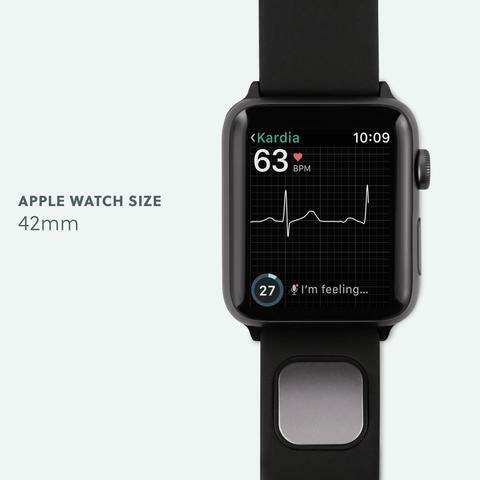 The AliveCor KardiaBand is a new sensor compatible with the Apple Watch that can detect dangerous levels of potassium in the blood with extremely high accuracy. While the US Food and Drug Administration has not yet approved KardiaBand for the detection of Potassium in the blood, the technology certainly looks promising. Claiming the ability to detect potassium levels with a 94 percent accuracy, it may be the first of many steps towards technology that can give us vital health information without the use of invasive needles. AliveCor’s KardiaBand is a small sensor that snaps into a slot on the Apple Watch wristband. The user touches the sensor, which proceeds to take an electrical activity reading of the heart called an electrocardiogram (EKG). This technology is useful to detect abnormal heart rhythms as well as atrial fibrillation, which is then relayed to an Apple Watch app. Research on the KardiaBand was carried out with assistance from the Mayo Clinic – one of the top hospitals in the world. Testing showed that this same technology could be used to detect high levels of potassium in the blood – a condition known as hyperkalemia. Hyperkalemia is a symptom of multiple conditions and can be caused by issues such as diabetes, dehydration, and chronic kidney disease. If left untreated, it can lead to kidney and heart failure – and to make matters worse, there are no obvious symptoms for hyperkalemia. The only way to tell at this point in time is with a blood test, or potentially with the KardiaBand. The development of the KardiaBand has been a long time coming, and it looks as if it’s shaping up to be a sophisticated piece of medical equipment. AliveCor worked with the Mayo Clinic to develop a new way to analyze EKG data, using a dataset including 2 million EKGs linked to 4 million potassium values – data which was collected over the course of 23 years. The KardiaBand functions using artificial intelligence that was trained by a research team. By pointing out EKGs that were from people with high potassium levels, the AI was eventually able to detect hyperkalemia with 90 to 94 percent accuracy. While the KardiaBand certainly holds a lot of promise for the detection of high potassium levels in the blood, it will be a good while before we get our hands on the device as a consumer. Last November, the FDA did clear the KardiaBand as the first medical device that works with the Apple Watch – adding to the legitimacy of the product. The company behind the KardiaBand has stressed, however, that it’s not currently yet FDA approved for detection of hyperkalemia – that testing has to be carried out separately and hasn’t yet been implemented in a reliable way into current KardiaBand devices. Moving forward, the team behind KardiaBand will be carrying out more clinical testing and working closely with the FDA to bring this novel new form of potassium testing to users around the world. Apple is slowly building out the functionality of a device that may soon become the go-to device for luxury fitness and health monitoring. We expect the scope of the Apple Watch app ecosystem to only expand as more companies get their equipment through the testing with the FDA and turn the Apple Watch into a groundbreaking medical companion.